The next step in your diver education. This course is designed to take a serious subject and turn it into enjoyable and rewarding training. The focus of the course is awareness and prevention of potential problems. You will also receive training in proper rescue techniques and emergency management, with emphasis on flexibility. After the academic sessions, you will participate in practical application using realistic scenarios. 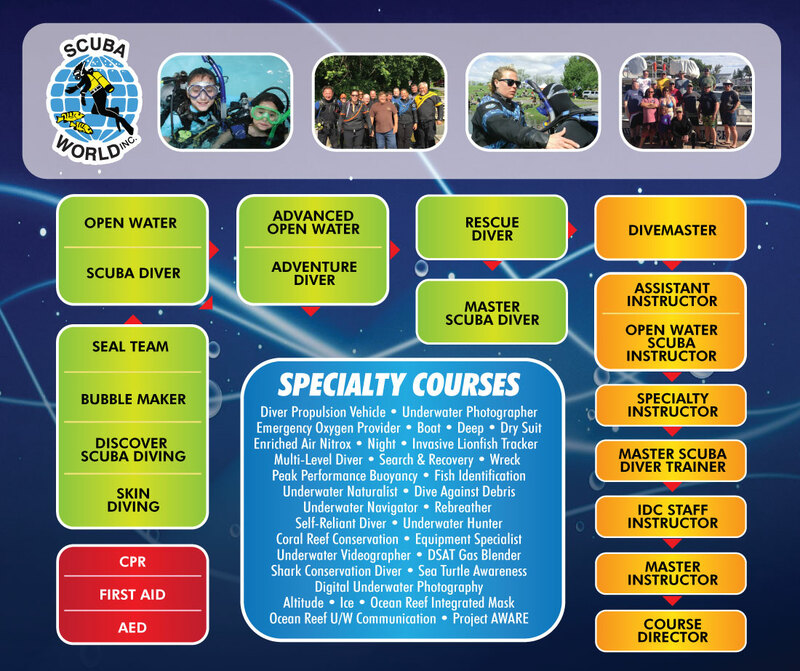 Prerequisites: Navigation Adventure Dive from either the Adventures in Diving Course or Advanced Open Water and Emergency First Responder (or equivalent) certification. What’s in my Rescue Diver Crew Pack? Once you have purchased your training materials, read the text, watch the DVD, and complete the knowledge review questions at home, at your leisure, then schedule your academic sessions with a knowledgeable and friendly Scuba World Instructor. We offer weekday, weeknight, and weekend sessions. The academic portion is taught at Scuba World. This fee covers academic material and instruction. You will need to have one or more surface signal devices (audible and visual). You must have your own personal equipment which includes: mask, snorkel, fins, boots, gloves, weight and weight belt (these are required items from the Open Water Course). You must provide a regulator/octo/gauge, wetsuit, hood and tank (this equipment can be rented from Scuba World). What are the Open Water Training Activities? Upon completion of your academic skills training, you are now ready for practical application of the skills and procedures presented. First we will review self-rescue techniques. Then you will practice 12 realistic rescue scenarios. You will have the opportunity to experiment with the different techniques. You will be learning rescue techniques in an enjoyable setting. Rescue Diver training activities are always a favorite! Accommodations to stay overnight. Either motels are $100-150 per night or camping at the quarry is $10 per night. We can also do Open Water Rescue Diver checkouts on any of our Florida Keys trips (March, August, November). Rescue scenarios are done off of the dive boat.